Not once have I regretted resigning from ACT. I was very lucky getting the effective heave ho in 2008. It hurt at the time but the environment and personality politics would have driven me up the wall. Act founder Sir Roger Douglas, with deputy leader and Consumer Affairs Minister Heather Roy, is understood to have led moves in the party against Mr Hide during the controversy over the international travel costs of his partner. The Act board was told the caucus had issues over the leadership, and a special caucus meeting was called for November 22. Mr Key is understood to have learned about the moves against Mr Hide shortly before that - between his return from Apec in Singapore and his trip to Trinidad for the Commonwealth summit. He told Mrs Roy that if Mr Hide were removed from the leadership, her own ministerial position would be in jeopardy. Oh Lord. What a loss that would be. What a joke. Without Rodney there would be no ACT today. Sure he made mistakes this year, big ones, but so did Sir Roger. Looks like they are expending more energy on internal power games than advancing political ideas. Pathetic. It isn't until you are well and truly out of it that you can see how silly this all looks; dump Rodney?? And replace him with whom, pray tell? At this rate Rodney is going to end up being the Ron Paul of NZ politics. ACT needs him far more than he needs ACT. Listening to NewstalkZB Face Off this morning, John Morrison, Wellington City councillor (and famous ex-cricketer), was heard describing his 2009 as a "banana" year. Because BANANA stands for Build Absolutely Nothing Anywhere Near Anything. Mr Morrison gets somewhat frustrated with the anti-s, the environmentalists and RMA and can frequently be heard opining on the subject when he sometimes sits in for Justin du Fresne. I have warmed to him. A "separate Maori welfare system." Duncan Garner is reporting that "the Government is close to a decision that would see millions of dollars set aside to fund a separate Maori welfare system." This is the extension of Whanau Ora. While the details are not known, not a lot can be said. As a rule I am against separatism. But the interaction between Maori and the current welfare system is unacceptable. Any change should be viewed, at least initially, with an open mind. However, I can speculate. And this is what I think. Whanau Ora is Tariana Turia's baby. Tariana is completely opposed to any interference with the DPB, which is at the core of Maori welfare. She and Sharples have strenuously opposed work-testing which National are insisting they will press ahead with. If the Maori Party can effectively set up a separate welfare system for Maori they can set their own rules. The extension of Whanau Ora serves as a political solution for National. They can keep Maori onside while satisfying their own constituents desire for a tightening up on welfare. I seem to have a mental block at the moment. It may be that I am pouring any creativity I have into paintings for an exhibition next year (and gnawing over the results). Or maybe the issues that keep coming up are defeating me. Take yesterday. Ex Alliance MP, Liz Gordon, released a report about the children of prisoners saying she was shocked at their circumstances; their poor physical and mental health and the inter-generational tendency for children of prisoners to also become prisoners. That's hardly surprising. Yet the paper puts forward no ideas for how to break the cycle beyond an examination of current interventions. Talkback host, Danny Watson tried to elicit comments from his audience yesterday and only got 2. One from a teacher who relieves at a school where having a father in prison isn't remarkable and children seemed to take it for granted. CYF were generally involved and he felt that the only way to prevent inter-generational transfer was the remove the child completely from their current environment but conceded, that action in itself could cause more behavioural problems. I am tired of pointing out that the incentives to have children, when totally ill-prepared to, have great bearing on outcomes years down the line. Not a solitary politician wants to develop that line of thinking or go down that road. So we seem stuffed. Or perhaps I am still depressed about my recent failure (officially described as 'their' failure) to engage with exactly this sort of family. The organisation I work for had to pull the plug on the case after repeated missed home visits (I was there but they were not). I very much wanted to help this likeable client, the mother, yet there were other family members making it almost impossible. It makes you want to hit your head very hard against a brick wall when you can't get people to see the potential they have to make their lives better. So I am at a low ebb. Further analysis of Treasury spending projections shows that they are predicting the number of people on the DPB will rise to over 120,000 by 2014. (This allows for a cost of living rise of 2% each year). I wonder what Treasury bases this on? Have they, for instance, factored in work-testing, which should see a drop based on previous NZ experience? In which case, are they predicting growth elsewhere? There is a subset of recipients, those caring for the sick and infirm, people who would otherwise be hospitalised, which is growing quite quickly. When you think about that group, it is also enlarged by the greater degree of family breakdown. Historically women provided this sort of care unpaid as they were supported financially by a husband. Benefits create a domino effect. Initial uptake leads to further uptake. Similarly a single parent who stays single and welfare dependent can't provide support for a daughter that gets pregnant without a partner. She, in turn, goes on a benefit. The domino effect is just one way that the welfare state actually creates need. Here are the forecasts from the Half Year Economic Fiscal Update. Population growth is estimated at 5.3 percent by 2014. Note very little extra spending is forecast in health (8.4 percent), education (3.5%) or law and order (7.3%) for the next 6 years, yet welfare is going up by 26.9 percent. OK, a good part of the additional spending is Super (putting up the qualifying age could reduce that substantially) but so are Sickness (33%), Invalid (18%) Domestic Purpose's Benefits (26%) and accommodation supplement (31%). As a portion of total Core Crown Expenses welfare will rise from 30.2 to 32.2 percent. This country's attitude towards welfare, as personified by Treasury and the government, seems utterly defeatist. All the media hype about alcohol inevitably leads to discussion on radio. 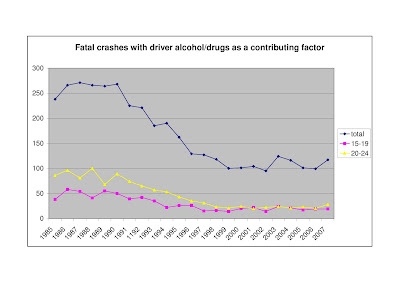 Yesterday there talk about young people drinking and driving and a suggestion that it didn't happen "when I was young". That there are too many funerals of young people. One caller said that they attended 5 such funerals. I had Robert in the car with me listening and was telling him the opposite. When I was young, drinking and driving was far more routine. Now it could be that the people talking about "when they were young" are much older than me but I don't get that sense. There are a lot of middle-aged folk who have forgotten that their generation drank just as much, smoked far more and did drugs, some the same and some different. Media coverage is probably responsible for creating an impression that the youth of today are causing far more mayhem and loss of life on the roads. But that simply isn't true. Anyway I promised to show him the statistics. 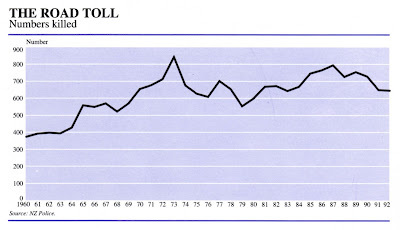 The next graph shows the total road toll from 1960 to 1992. Clearly there is quite a lengthy history of it being much higher than it is today. I do not have matching statistics for specific crashes with alcohol as a factor but can tell you that in 1973, the peak year, the yearbook has a breakdown for the 'nature of accident' but alcohol isn't even mentioned. That isn't because people didn't drink. It's because there wasn't an official acknowledgement of or focus on the link between drinking and driving. After all the recent talk about catching up with Australia economically, here's one area where we are way ahead. AUSTRALIA - The Bureau of Statistics report shows that 29,300 Australians were in jail on June 30 this year, 1700 more than on the same date in 2008. NZ - In August 2009 there was more than 8300 prisoners spread across 20 prisons throughout the country. If Australia caught up to NZ they would be imprisoning 41,500 individuals. Interesting trivia; In New South Wales, most foreign born prisoners hail from NZ. John Key has milked his state house upbringing for all its worth, yet he is now denying 500 more Auckland families that same opportunity. Seem contradictory? Not really. I’ve long thought that whereas Labour believes John Key did well because he grew up in a state house, he believes he did well despite growing up in a state house. That is just the most absurd statement. Labour believes John Key did well because he grew up in a state house. What are the implications of that? If John Key did well because he grew up in a state house then everybody who grows up in a state house should do well? If John Key hadn't grown up in state house he would not have done well? John Key grew up in a generation when state houses weren't routinely occupied by people without jobs. If parent/s work, children are likely to follow in their footsteps. Having a job is a good enough definition of 'doing well' for me. Whether the house was owned or rented didn't make the difference. What John Key got from his mother was a work ethic. Both Moana Mackey and John Key make too much out of growing up in a state house. Monday morning and looking for real news, I find myself awash in a sea of alcohol admonitions, etc. Alexandra police are warning Christmas revellers to behave after a weekend of alcohol-fuelled offending. Sergeant Ian Kerrisk said officers made nine alcohol-related arrests and picked up three drink-drivers between Friday and Sunday evenings. "The silly season is well and truly upon us. Alcohol Action New Zealand has praised Timaru's lower rate of drunken offending linked to the earlier closing time of local bars. Alcohol Action medical spokesman Professor Doug Sellman said the group supported Timaru's efforts and that the drop in crime was "entirely consistent" with previous research. In October 2007, Timaru bars shifted to a 3am closing from 5am. Christchurch central area commander Inspector Derek Erasmus yesterday pointed to pre-loaders as a significant problem during an otherwise quiet weekend. "There was plenty happening in terms of drinking ... The biggest issue was that many people were already drunk before coming into town." Erasmus said an extra 30 police officers patrolled the city on Friday and Saturday nights as part of Operation Unite. Oamaru police have made a number of drugs-related arrests this week. Detective Sergeant Mike Ryder said 12 people faced charges. Eight had been arrested and the others were still to be located. In what may be a first in New Zealand, a Picton house could soon be in Crown hands after its owner was convicted of commercially growing and dealing cannabis there. Gary Walter Tittleton, 63, a sickness beneficiary, appeared in the Blenheim District Court this week and admitted cultivating cannabis and possessing cannabis for supply after police searched his Picton home on September 21. Early-morning raids yesterday netted a “significant” amount of guns and drugs from Gisborne homes. Police searched 18 houses in and around the city as part of an operation targeting people dealing in cannabis and methamphetamine. Fifteen people — including five from one family and gang affiliates — face numerous drugs charges as a result of Operation Rattle. Around 50 police staff were involved. They are already the target of legislative moves to raise the driving age and the drinking age and Hamilton City Council is moving locally by mooting a ban on drinking alcohol in all public places. The ban would come into effect between 10pm and 6am. Alcohol-related crime costs New Zealand $1.1 billion and Australia $2.14 billion annually. So there it is. NZ on a Monday morning. Destined to do what it has done since colonisation. Fight the real and imagined evils of alcohol and other drugs. It's terribly, terribly boring. No wonder so many people want to alter their reality. Has income inequality grown during the recession? A great deal is talked about income inequality (and the evils inherent) and there is some MSD research available about it. To satisfy my own curiosity I created the following graphs to flesh out how incomes are distributed in NZ. Using New Zealand Income Survey data I made the first from June 2005 and the second from June 2009. The two sets of data have some differences in terms of the income parameters set and unfortunately the Asian group is missing from 2005. (It largely appears as 'other' but is not distinctly Asian). The spread of incomes within the ethnicities has stayed relatively stable but I note the number of Maori has increased beyond natural population growth which may indicate that the recession has brought many Maori home. 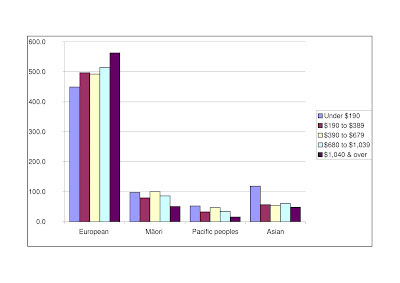 The most notable aspect of the two graphs is that there is a greater likelihood of a European being in a higher income group and a greater likelihood of a Maori, Pacific or Asian being in a lower income group. That is shown in the inverted shape of the clustered columns. An effect from WFF is probably showing in the change in the European spread with more people moving into the 4th highest quintile. The high proportion of low income Asians reflects (I think) the high number of Asian students (the data is for the population 15 years and older) and that families often support their own elderly. In contrast, the high proportion of low income Maori and Pacific reflects reliance on benefits (particularly Maori) and unskilled work. Accepting for the large low income group, Asians have the least income inequality within the group. For Maori and Pacific, within their respective groups, the inequality is greatest. That is, the difference between the percentage that are 'poor' compared to the percentage that are 'rich' is greatest. And what about between the groups? 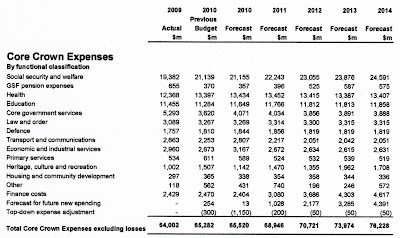 In 2009 the same figures were $728, $548 and $479 . For Asians, $512. 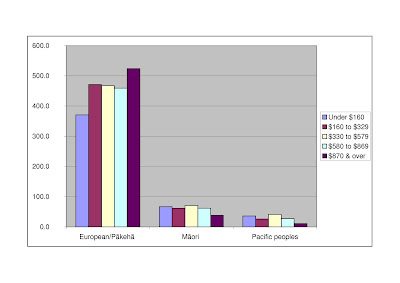 The respective increases for each group were European 14%, Maori 16% and Pacific 16%. So the inequality between the groups is also fairly steady.